the dancer leads the procession (1999). Jennifer Lee (piano). Recorded 20th February 2015. Diversions for Quintet (2003). Thomas Hutchinson (oboe), Jean-Marc Fessard (clarinet), Charmian Keay (violin), Nigel Keay (viola), Raphaël Schwab (double bass). Recorded 8th October 2012. Allusions for clarinet solo (2013). Jean-Marc Fessard (clarinet). Recorded 29th July 2014 at the Temple de Luxembourg, Paris. Double Jeu for Two Violas (2012). Alphonse Dervieux & Nigel Keay (violas). Recorded 18th June 2014 at the NZ Embassy in Paris (rue Léonard da Vinci). Piano Quartet (1986). 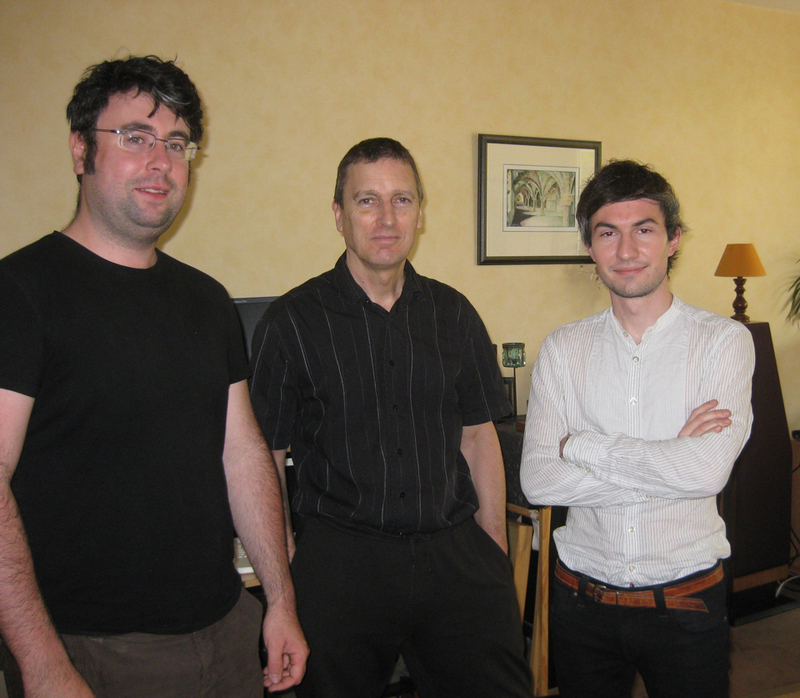 Guillaume Antonini (violin), Alphonse Dervieux (viola), Andrea Mundy (cello), John-Paul Muir (piano). Recorded 7th June 2013. Photo 1, photo 2. Little Tango Suite (2004). John-Paul Muir (piano). Recorded 7th June 2013. 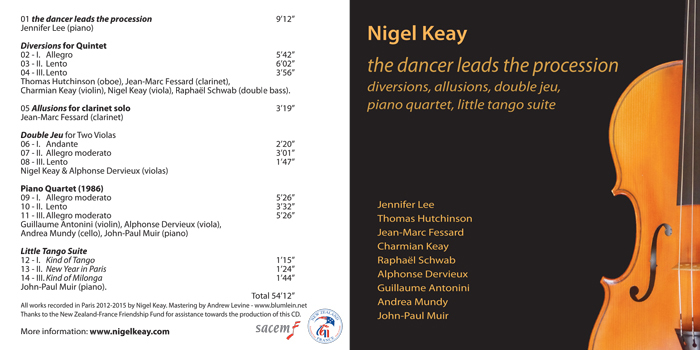 All works recorded by Nigel Keay with CD mastering by Andrew Levine of Blumlein Records. Thanks to Dora Cantella for the use of her pianos for the recording of the dancer leads the procession (Steinway piano), Piano Quartet and Little Tango Suite (Yamaha piano). Jennifer Lee, DMA., MMP (Guildhall Artist) Since her arrival in the UK after completing her undergraduate studies in New Zealand, Ms. Lee has continued to perform extensively at major venues in UK and abroad as a recitalist and chamber musician. She has been successful in winning prizes at the 8th Scottish International Piano Competition, Royal Overseas League Competition, MBF Awards, Making Music Awards and First Prize at the Eastbourne Symphony Young Soloists Competition among others. She has recently completed her doctorate degree sponsored by Creative New Zealand at the Guildhall School of Music and Drama and City University London under Martin Roscoe. Thomas Hutchinson is a New Zealand-born oboist presently studying at the Conservatoire National Supérieur de Musique de Paris. Clarinetist Jean-Marc Fessard leads an international career both in chamber music and as a soloist accompanied by various prestigious ensembles. He is a member of the contemporary music group Ensemble Sillages. JMF has recorded some 15 CD's for labels such as Naxos, Dux, Universal, Clarinet Classics, Signature Radio-France, Triton, Leibovitz, Kalidisc, and Quantum, which regularly receive excellent reviews in the specialised press. Auckland-based violinist Charmian Keay was born into a musical family and has played the violin for as long as she can remember. Mainly taught by her mother Miranda Adams, other teachers included Justine Cormack, of the New Zealand Trio, Kevin Lefohn, director of the Queenstown Violin Summer School (NZ) which Charmian attended in January 2006, and Tessa Petersen. She studied for her Postgraduate Diploma in Performance as a Trinity Laban Scholar at the Trinity Laban Conservatoire of Music and Dance with Matthew Trusler, one of Britain’s most acclaimed solo violinists. Raphaël Schwab studied at the Conservatory of the 10th District in Paris and at the CIM de Paris before being admitted to the Jazz Department of the Higher Conservatory in Paris in 2005. He has studied with Christophe Wallemme and Riccardo Del Fra. A versatile musician, he participates in several classical and contemporary music groups, and collaborates with a number of jazz musicians in Paris. He is a member of the Paris-based bigband "Ping Machine". Violist Alphonse Dervieux, graduated with a DNESM in Viola from the Conservatoire National Supérieur de Musique et Danse de Lyon in 2006 and has since been invited to play in various orchestral formations; l'orchestre de chambre d'Auvergne et l'orchestre de Besançon and occasionally as principal viola in l'orchestre de Dijon and l'orchestre de l'opéra national de Lyon. Violist in the Leonis String Quartet since 2003 he has performed with this group in many concert halls in France and elsewhere: Italy, USA, Japan, China, Norway, Spain, Germany, Holland, Serbia, Switzerland.. He has collaborated with artistic personnalities as varied as JF Zygel, Claire Desert, Philippe Girard, Scali Delpeyrat, Philippe Berrod, Olivier Charlier, Marie Joseph Jude, Mireille Delunch, David Grimal, Olivier Py or Ariane Ascaride. Prizewinner of the Genva International String Quartet Competition in 2006, he was equally first-prizewinner of the National Young Musician's Competition for Violists. Alphonse Dervieux has played since 2002 on a viola made by Stephan Von Baehr. Guillaume Antonini was born in Avignon in 1979. He studied violin performance at the Conservatoire National Supérieur de Musique et de Danse in Lyon. He plays first violin in the string quartet Quatuor Leonis, founded in 2004. The quartet has been mentored by renowned musicians and ensembles such as Valentin Erben, Rainer Schmidt, Eberhardt Feltz, Gábor Takácz-Nagy and the Quatuor Ysaÿe. In 2006 Leonis won Third Prize in the Geneva International Music Competition – this was followed by numerous concerts in such venues as Salle Pleyel and the Théâtre du Châtelet in Paris, at the Santa Cecilia Festival in Rome, and the Norfolk Chamber Music Festival in North America. In 2008, Olivier Py made the four Leonis musicians “artists-in-residence” at the Théâtre National de l’Odéon in Paris. In 2015 they began a residency at the Cartoucherie Theatre in Paris. During the summer of 2012 Guillaume Antonini was conductor of the Salzburg Festival production of Peer Gynt, a new adaptation of Ibsen’s masterpiece by Irina Brook. He is now a member of Irina Brook’s company, The Dream Theatre. Convinced of the necessity to defend contemporary music, he often works with the composer Jacopo Baboni Schilingi. Together, they have explored a new approach to perform this repertoire. 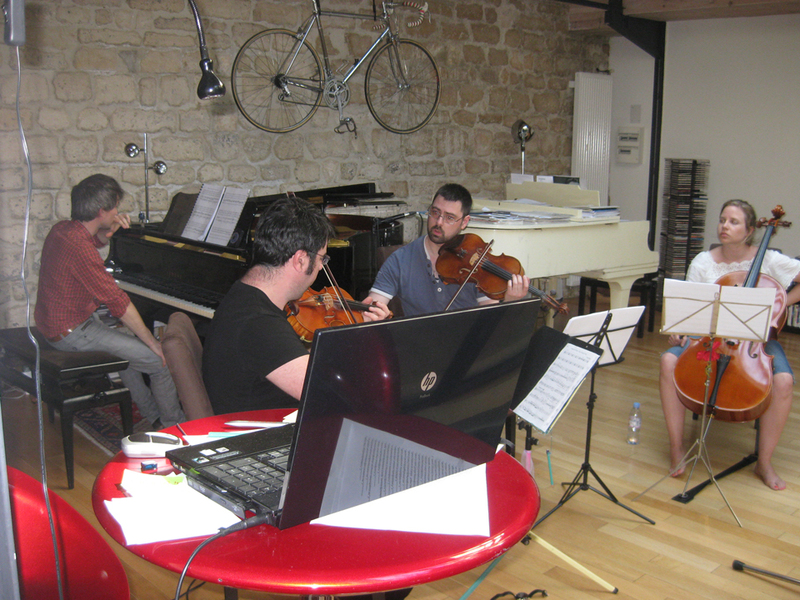 Quatuor Leonis premiered Jacopo Baboni Schilingi's new quartet with electronics De la nature du Sacre during the Academia Santa Cecila Festival in 2012. Guillaume Antonini plays on a violin especially made for him by Stephan von Baehr of Paris. Andrea Mundy was born in Auckland, NZ, graduated from the University of Auckland in 2004 with a Bachelor of Music, where she received the university's Arts and Cultural award for excellence in music performance and was awarded the Greta Ostova Violoncello Scholarship. In 2010, she completed a Masters of Music degree in cello performance at the Royal Northern College of Music in Manchester where her tutors were Karine Georgian, Peter Dixon and Raphael Wallfisch. Andrea has participated in cello masterclasses with Ralph Kirshbaum, Raphael Wallfisch, Steven Isserlis, Christoph Henkel and Louise Hopkins. She has performed at various UK music festivals such as the Charterhouse International Music Festival, the Liverpool SoundFest and the Aberystwyth MusicFest. In 2007 she founded the Lumineux Piano Trio in Auckland performing with them at the Te Anau Music Festival, NZ in 2014. In September 2012 she was invited to play at the NZ Embassy in Paris with a NZ piano quartet. Since 2011 she has worked with various chamber groups, and has toured Lithuania with the Orphic Piano Trio performing at music festivals. She is also one-half of the cello duo, Cello2ette, and enjoys collaborating with the Quartet Pro Musica, and pianists Angela Lim and John-Paul Muir. She plays on a cello made by Noel Sweetman. Originally from New Zealand, Nigel Keay has lived in France since 1998. He has always been involved in the perfomance of his own works either as a conductor or viola player. 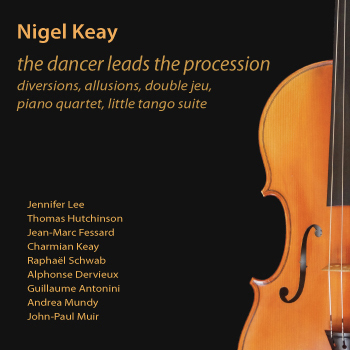 Nigel Keay’s earlier works were sometimes atonal however since the 1990s his music has included more tonal elements and is often inspired by literary and philosophical ideas. John-Paul Muir has established himself as one of the finest pianists to emerge from New Zealand in recent years, and certainly one of the most versatile; equally at home in both classical, jazz, and contemporary genres. In 2010, having received top honours in all of New Zealand's major music competitions, he graduated from the University of Auckland with a Master of Music degree under the guidance of Rae de Lisle, and moved to London to study with Senior Professor Joan Havill at the prestigious Guildhall School of Music & Drama. He has since graduated with distinction from their Artist Masters Programme, and is currently enjoying a freelance career based in London. Thanks to the New Zealand France Friendship Fund for assistance towards the production of this CD.